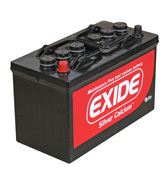 Exide Silver Calcium Batteries are suitable for all trucks and off-road vehicles. They are the only locally manufactured commercial batteries that pass the SANS 60095-1 Class B vibration test. This means that they offer extreme vibration resistance, making them capable of withstanding even the most demanding conditions. Contact your nearest Exide outlet to discuss your specific battery needs.